Invest your time, teaching experience or educational expertise with The Rotary Club of Fajara in The Gambia, West Africa. Educators have a huge task. Good teachers make good schools, good schools produce good students. The teaching profession needs to be given more respect in the community and we need to value and support our best teachers and schools. It is difficult to find up to date, accurate figures but it has been suggested that even today over 70% of children are not enrolled in and do not attend any kind of school. The percentage of young people in their twenties that have successfully graduated from Year 12 of Senior Secondary School is small indeed. The first schools in Africa were set up by missionaries from Europe.The Gambia has some excellent mission schools, some of which were opened at the beginning of the 20th century. They have a history of delivering a first class education to those who were lucky enough to attend. Today, mission schools are run by Anglican, Baptist, Catholic, Methodist and Pentecostal Churches. The Gambia is a Muslim country and approximately 94% of the population are Muslim. However, in the main all schools, whether Mission, State or Private, more closely reflect the demographic make-up of the country. The Gambia is home to many tribes all of whom have their own tribal language. 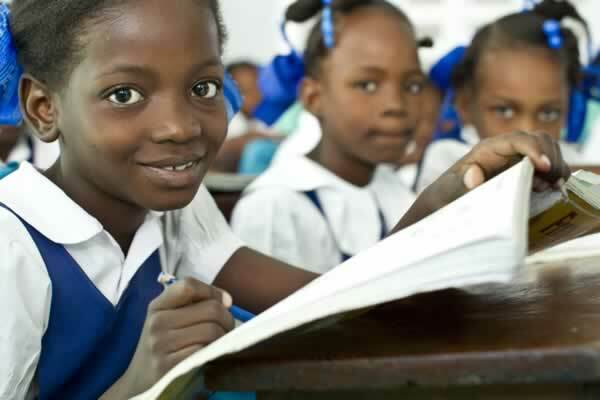 English was chosen to be the official language of the Gambia and all education is delivered in English. The exception being the Madrassa Schools which teach only Arabic and concentrate on teaching Koranic and Islamic Studies. As can be imagined, teaching and learning in a ‘foreign’ language presents huge difficulties to both teachers and pupils. The State runs Lower Basic, Upper Basic and Senior Secondary Schools but not Nursery Schools – due to financial constraints. Nursery schools take children from age 4 to 7 years. Children have to be 7 years old to enter Lower Basic School (LBS). Lower Basic runs from Grade 1 to Grade 6. Upper Basic (UBS) starts at Grade 7 to Grade 9 and Senior Secondary runs from Grade 10 to Grade 12. In state schools pupils have to sit exams in the final year of their lower basic and upper basic school. They have to achieve a pass mark in order to progress to the next level. The government does not allow for re-sitting of final year exams. Pupils who fail to achieve the required grades can join skill schools or learn a trade. There are many private schools including the Banjul American Embassy School (BAES) etc. which are expensive and are run for profit.